If you attended BlogHer this year in New York City, then you may have found a small spot of serenity at the Wal-Mart & Hershey’s Camp Bondfire. Upon entering the hotel suite, each guest stepped into a backyard of campfire fun complete with tabletop grills to roast marshmallows and make scrumptious graham cracker and chocolate sandwiches also known as s’mores. It was the tastiest fun at BlogHer. But this campfire themed fun wasn’t without reason. 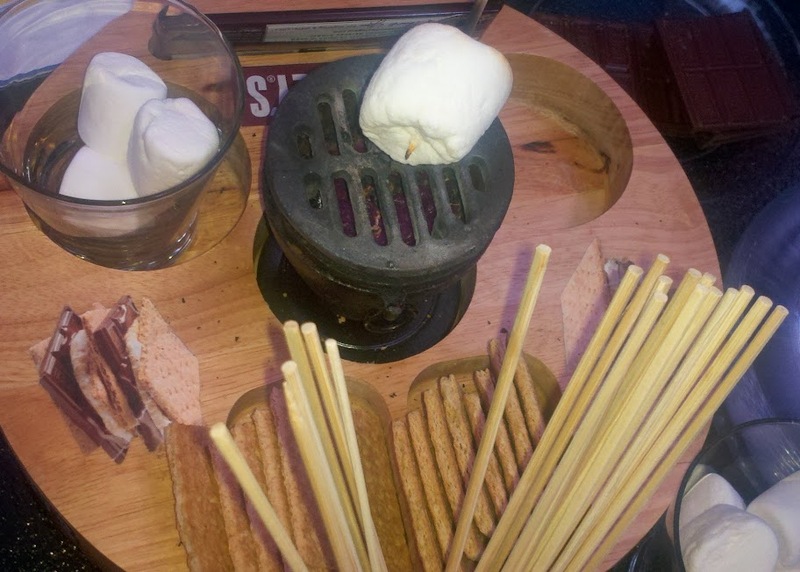 Did you know Friday, August 10th is National S’mores Day? For my chocolate loving family, that’s old news. However, this year, we decided to commemorate the occasion with a twist on an old favorite: S’more Hot Chocolate. So this season, when you’re snuggling around a campfire, wrap your hands around this warm chocolaty goodness. 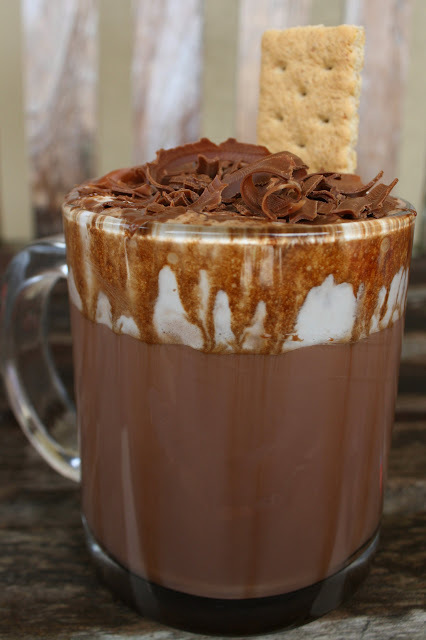 An adapted Hershey's Hot Cocoa recipe topped with all the flavors of a s'more. In a small mixing bowl, stir together sugar, cocoa and salt. Gently stir in water. Pour mixture in a saucepan and warm over a medium heat, stirring constantly, until mixture comes to a boil. Stir 2 minutes more. Lower heat and add milk, stirring constantly. Warm milk through, but do not allow milk to boil. Remove from heat and add vanilla. Beat with a whisk until foamy. Then, pour hot chocolate into a mug. Add fluff to a small storage-size Ziploc bag. Cut a small hole in corner of bag and pipe over cocoa carefully so it floats. Very carefully pour chocolate syrup around rim of mug. Grate milk chocolate over fluff. Add one square of graham cracker to hot chocolate and serve. Are graham crackers similar to digestives? Welcome from across the pond, Martin! Yes, graham crackers are similar to digestives only graham crackers are slightly thinner. S’mores are a camping must. I hope you enjoy them!